The first thing that struck me about Denise Kadilak’s talk at Content Marketing World was the title: How to Document and Architect Your Content Strategy. We hear over and over that a content strategy must be documented … but architected? What does it mean to architect a content strategy? Why and how do we do that? 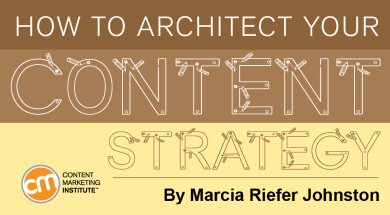 What does it mean to architect your content strategy? Note: I use “architect” as a verb to describe a specialized activity – designing an information space – since information architects often use the term this way and since I lack a better word. Whatever your role – an information architect, a user-experience practitioner, a content strategist, a writer, or a hybrid of the above – if you’re part of the team that’s architecting a content strategy, consider designing a space for everything related to planning for the creation, delivery, and governance of useful, usable content. (This bolded phrase is Kristina Halvorson’s frequently quoted definition of content strategy). Why architect your content strategy? Why isn’t documenting your content strategy enough? Why do you need to architect it, too? Because content strategy comprises many parts. The more mature your content team, the more strategy-related information you have and the more architecting you need to do to make all that information usable. Your content strategy documentation must be detailed, accessible, and easy to use, understand, and update. For it to be all those things, you need architecture, Denise says, especially as your strategy grows to include more and more elements. A giant Word doc – or pile of Word docs – doesn’t cut it. Word is the way almost everybody goes. ‘Here’s our 70-page content strategy. We’ve put it in a binder, and we’ve got copies of it all around the office.’ Don’t do that. What do those people care about? What voice do I use? Where do I go with style questions? What key terms do I use (and what terms do I avoid)? Where do I find examples of similar content to emulate? Would you want your new boss to give you The Big Fat Content Strategy Binder (or its electronic equivalent)? Or would you rather be pointed to a thoughtfully architected internal website? How do you architect your content strategy? What matters, just as with a customer-facing website, is that both the architecture and the content of your internal website serve the needs of your audience – your content creators and anyone else with a stake in your content strategy. As I’ve heard many content strategists say, you need a content strategy for your content strategy. In other words, as you design your internal website, plan for the creation, delivery, and governance of useful, usable content about the content strategy itself. Denise gave an example from her job as information architect and manager of a content team with Blackbaud Inc., where she’s part of its user-education team within research and development. First, some context. Originally, her team was responsible only for the Help files that were built into the company’s software applications. About five years ago, her team convinced several other content teams that it should curate all client-facing content related to the software because (a) her team’s writers were more familiar with the products than the other content teams and (b) people in several other teams – marketing, training, product support, and product services – were copying and pasting her team’s Help content into other deliverables, using inefficient processes to do so. Whenever we released our software, our updated Help content would go out with it, and all these other content creators, including marketing, would go in and copy and paste from our Help system. In a way, that was great because we wanted our content used as extensively as possible, but we knew we could find a more sophisticated way of doing this. Denise’s team met with their stakeholders and revised the content processes. Today, in addition to creating the software for Help, Denise’s team creates all the content for product support and product services and some of the content for marketing and training. They do this by using an XML-based authoring tool (Madcap Flare) that enables them to create single-sourced content modules (topics) that are format-free, structured, reusable, and semantically rich – in other words, intelligent content. 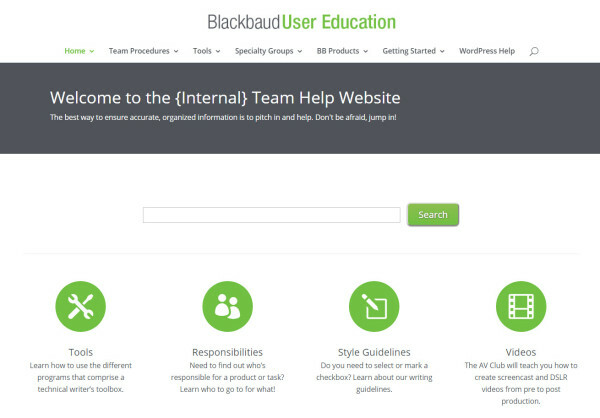 Today, Blackbaud content creators use an internal WordPress site to communicate and maintain the elements of their content strategy. “It’s a lot easier for us to find what we need,” Denise says. The site’s home page (shown here) has four main sections: Tools, Responsibilities, Style Guidelines, and Videos. Does your company have a resource center like this – an internal website that enables content creators and other stakeholders to align their efforts with your content strategy? If so, please tell us how it has worked (or hasn’t worked) in a comment. If you are serious about putting content to work in your business, you won’t want to miss the Intelligent Content Conference March 28-30 in Las Vegas. Register today and use promo code BLOG100 to save $100.